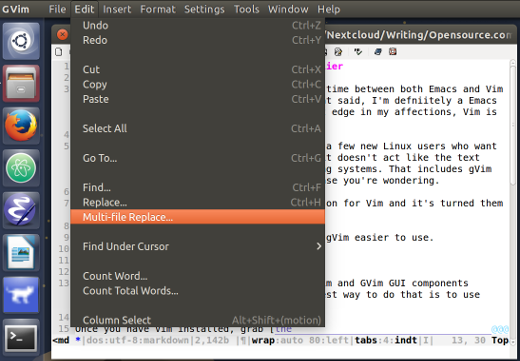 The Cream add-on makes the Vim text editor easier to use by putting a more familiar face on its functionality. About 10 years ago, I split my text editing time between Emacs and Vim. That said, I was and definitely still am an Emacs guy. But while Emacs has always had an edge in my affections, I know that Vim is no slouch. So do other people—even those who, like me, are all thumbs technically. 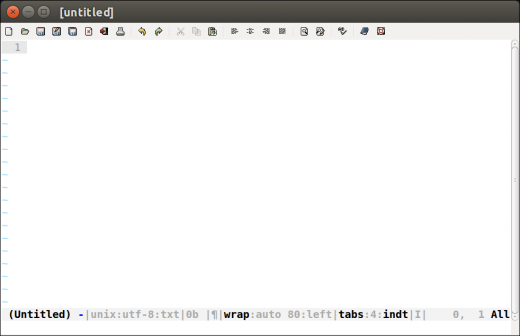 Over the years, I've talked to a few new Linux users who wanted to use Vim but were a bit disappointed that it doesn't act like the text editors they've used on other operating systems. That disappointment changed to satisfaction when I introduced them to Cream, an add-on for Vim that makes it easier to use. Cream turned each of them into diehard Vim users. Let's take a look at Cream and how it makes Vim easier to use. Before you can install Cream, you'll need Vim and GVim GUI components installed on your computer. I find the easiest way to do that is to use your Linux distribution's package manager. Once you have Vim installed, grab the installer for Cream or, again, turn to your distribution's package manager. Once Cream is installed, you can fire it up by selecting the entry from the application menu (for example, Applications > Cream) or by typing cream into your program launcher. If you've used GVim before, you'll notice that Cream doesn't change the editor's look and feel too much. The biggest cosmetic differences are Cream's menu bar and toolbar, which replace the stock GVim menu bar and toolbar with ones that look and group functions like their counterparts in other applications. Cream's menus hide a lot of the more techie options—like the ability to specify a compiler and the Make command—from the user. As you get more familiar with Vim by using Cream, however, you can make more of those features more easily accessible by selecting an option from the Settings > Preferences > Behavior menu. With those options, you could (if you want to) wind up with an editor that behaves as a hybrid of Cream and traditional Vim. Cream isn't only driven by its menus. While the editor's functions are only a click or two away, you can also use common keyboard shortcuts to perform actions—for example, CTRL-O (to open a file) or CTRL-C (to copy text). There's no need to shift between modes or remember Vim's somewhat cryptic commands. With Cream running, get to work by opening a file or creating a new one. Then start typing. A couple or three of the people I've introduced to Cream have said that while it retains much of the classic styling of Vim, Cream feels more comfortable to use. Cream also comes with a number of add-ons that give the editor some additional features. Those features include the ability to encrypt text and to clean up the body of emails, and there's even a typing tutor. To be honest, I haven't found any of the add-ons to be all that useful. Your mileage might vary, though. I've heard a few Vi/Vim purists pooh-pooh Cream for "dumbing down" (their words) the editor. Let's be honest: Cream isn't for them. It's for someone who wants to quickly get up and running with Vim while retaining the look and feel of the editors they're used to. In that way, Cream succeeds admirably. It makes Vim a lot more accessible and usable to a wider range of people. I'm going to have to try that. I have been using 'nano' lately on Raspian and Ubuntu, but this looks like a great option. I tried out Cream years, when it was still actively developed. It's a great idea, but pretty much abandonware at this point. Wow. Really? Cream for people thath think GVim is too complicated? I suggest they just use gedit or some other gui-base editor. If they can't grok gvim, then there is not much hope for them advancing to vims other functions and configurations. Also, one advantage of vim is that is pretty much everywhere, but if you are using completely different key mappings, you won't be able to use vanilla vim in other machines.